A Kwik Shop in Topeka is a dangerous place to be. I had no idea of this until recently. One evening, Elena and I decided to get some night treats, so we stopped at a Kwik shop on our way home. It was a scary place. It seemed that the entire "hood" was having a celebration at their local corner shop. I'm not scared easily, but when there are 15 or more crazy-looking people all around you, one must be vigilant. I quickly grabbed what I was buying and kept looking at the car making sure Elena was okay. No one should die over a Kit Kat. But lately I realized that the ghettoness doesn't only take place at night at the Kwik Shop. The gheto-meter has been elevated to even the day time. I've seen chongas (white chongas) stopping for gas, cranking up their music, hoping to get noticed. 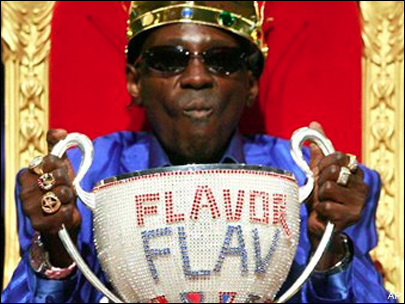 And just the other day, when we had to stop for gas or the car would die, I saw a guy that looked exactly like Flavor Flav. It really doesn't get more ghetto than that. You have surpassed my expectations, Topeka. A final note: Please, if you are white, pick up your pants. You are no one's homie or dawg. No one thinks you look cool and certainly nobody thinks you're menacing. If anything you look like one of the Backstreet Boys gone astray. Please, mature. 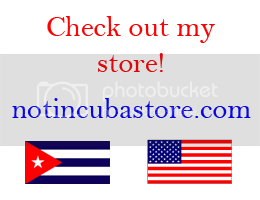 Posted in funniest blog ever, israel sanchez, not in cuba anymore . Bookmark the permalink. RSS feed for this post. 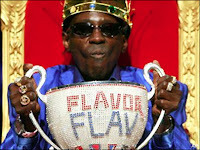 hahahaha "how do you even know what flavor flav looks like??" Lol oh no, my past has come back to haunt me. lol. Haha, that is awesome! Thanks for the comment and getting the sarcasm of that sentence!